I suspect, we all want to be better people. Deep down, most people are not satisfied with themselves, though they may never show it. In fact, many live lives walking around with deep feelings of guilt, shame, insecurity, and regret. The good we want to do is not what we do, and the bad we don’t want to do becomes exactly what we do. It’s an endless cycle in the quicksand of our human existence. With our list of imperfections tight in hand, we set off on our pursuit of trying to figure out what we can do to become a better person. We buy the books, watch the shows, go to the conferences, and maybe even join up with a church or some kind of religion. Or, maybe we just find a tribe of people to immerse ourselves in with whom our idiosyncrasies won’t become so noticeable to others and especially ourselves. When it comes to the brokenness in our lives, we typically go into either concealment mode, camouflage mode, or can-do mode. We either try to hide our flaws, camouflage them, or self-improve them. The problem is, none of that works, at least not for very long. Find me a person who has attempted to hide their imperfections, camouflage them, or self-improve their way past them, and at the end of the day you will have found a person that still deals with deep issues of guilt, shame, condemnation, insecurity and a lack of real, lasting improvement in their actions and attitudes. The sad thing is, the Christian church hasn’t been a very good place to become a”better” person either. More so than not, churches focus on being obedient and following religious rules while admonishing people to get better by doing better. Don’t drink, don’t smoke, don’t chew, and don’t go with girls that do. They treat obedience and doing the Word as the root of the Christian life. The focus becomes on loving Jesus more as the solution and the path towards an improved life. If you just loved Jesus more than you would be so much of a better person and be able to follow the rules. The problem is rules and religion don’t change people and behaviors. In fact, the Bible clearly states that the law (standards of God for living) actually stirs up the desire to sin. “…the sinful passions aroused by the law…” Romans 7:5 When you see a park bench with a sign that says, “wet paint” what do you immediately think of doing? Touching it. The truth is, I can’t love Jesus enough to get better. Trying to do so makes my love a self-focused work. It turns my performance into my identity. Therefore, I end up leaning on me instead of Jesus for who I am and what I can become. Furthermore, we tell true believers in Jesus that if they don’t love and obey God enough they are not really completely forgiven, their standing with God has surely been compromised, and they had better fix it, quick. We have told what are newly created people in Christ that they really aren’t completely new creatures because the “old man” is still there waiting to win back their life. No wonder people struggle with sin so much, especially believers. If you think, by your nature, you are a still a broken sinner at heart, then guess what you will do? Yup, sin. The Bible says, “As a man thinks in his heart, so he is.” Proverbs 23:7 If following the law (rules) and increasing your conscientiousness of sin is what we are told are the keys to becoming a better person, following that counsel will actually lead you to becoming a worse person in your behaviors and your heart will be filled with guilt and shame. No wonder why sin in the church is just as much a thriving reality as it is in the world. Guilt, shame, depression, and frustration are just as prevalent in church as they are anywhere else. The truth is, you can do all the spiritual gymnastics you want, but you can’t become a better person until you become a new person. All your efforts to become a better person won’t make you new or better, only the finished work of Jesus on the cross can make you new as you receive it through faith. Right believing is what leads to right living. Faith in the pure Grace of God through Jesus is the root, obedience is the fruit. You performance doesn’t determine your identity, your identity determines your performance. Satan is still vigorously trying to do the same with us, subtly trying to remove from our sense of identity that true believers are sons of God, beloved by God, and completely pleasing to Him. If we believe the wrong things about our identity, we will do the wrong things in life. An obedience problem is always first an identity problem. The truth is, God loves you perfectly. In fact, God is love. He can do nothing but love you. And you simply being created by God is reason enough for Him to make you the object of His love. It has nothing to do with what you have or have not done or will do. In a real sense, it would be illegal for God not to love you, He would be a house divided against Himself because He is love. We need this Grace because we are as good as dead without it. Deep down, everybody knows something profound and central is missing and there is a standard to which their life doesn’t measure up. When your heart leaps at this Grace and believe Jesus is the source of this Grace, everything changes. All that God has and provided for you becomes yours. For a true believer in Jesus, there is no condemnation over their life, none. You have become, through Jesus’ shed blood, the righteousness of Christ, and that is not merely a positional reality, but a complete reality. You are without blemish, all your sins (past, present, and future) have been put away (killed) through the cross, they are no more in the eyes of God. You have been made a new creation, the old is completely gone. You don’t have two natures, you have one. The old Adam is gone. (ref. Romans 6:6, Galatians 2:20) Christ lives in you, you have His mind. It is no longer your nature to sin, fear, worry, be depressed etc. Do we sin? Yes, because we still have of our earthly flesh, but it is no longer our nature to do so, and when we sin, it no longer defines us or separates us. Glory be to Jesus for His abundant Grace! You are no longer under the rules, but under Grace. 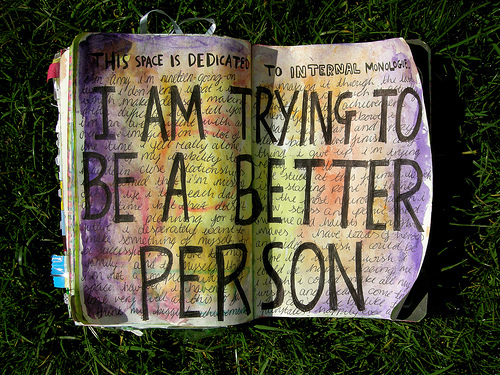 You don’t have to be a better person, you get to be a better person. Your don’t live from you, trying to be a better person. You live from Jesus, through faith in His work in you, and become a better a person. In fact, in Christ, you aren’t just a better you, you are a completely new you. 100% Jesus, 100% you. You lack nothing, absolutely nothing. This is the right belief of your identity, it’s all focused on Jesus and His Grace, not on your performance. Which, ironically enables you to perform with increasing faithfulness. Right identity leads to right living. People who believe in the true Gospel of the Grace of God through Jesus don’t sin more, they sin much less. Their freedom becomes a catalyst for faithfulness because their heart overflows with thanksgiving for what Jesus has done as they walk in a completely new sense of self and life without guilt, shame, and sense of condemnation. It truly is amazing Grace. An abundance of Grace is what leads to reigning (living much better) in life, not an abundance of guilt, shame, and rules. Believe in the abundant Grace of God for your life and see the results! Remind yourself every moment, “I am already forgiven, I am the righteousness of Christ, there is no condemnation, it is no longer my nature to sin, I am better than that, I lack nothing, greater is He that is in me than is in the World, I am fully pleasing to the Father, I am perfectly and completely loved, I am a son of God (Galatians 3:26)” and see how your life and living improve. Trying to live like Christ and become a better person from our own efforts is like trying to sing like Celine Dion. You can hear her voice in your head, but you never can match it with your own. But if Celion Dion could somehow live in you, you could sing just like her as you allow her voice to become your voice. Her identity becomes your identity. In the same way, Jesus lives (or can live) in you (through faith), and when we live from Jesus in us and the identity we have because of Him, we will more and more act just like Him. Becoming a better person is about our actions catching up with our true identity, not our identity being caught up in our actions. You cannot become a better person until you become a new person and believe it. Only Jesus can make you new. If you are in Christ through faith, you are a completely new person. You are a much better person, and when you believe that, you will act more and more like the person you are in Christ… much better! Right believing in the abundant Grace of Jesus leads to right living! Hallelujah, glory be to Jesus! Can I get a strong Amen?